Pecan nuts have a rich, buttery flavor. They can be eaten as they are or used in cooking, for example in sweet desserts. One common dessert with the pecan as a central ingredient is the pecan pie. Pecans are a good source of protein and unsaturated fats. 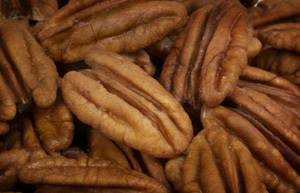 They are rich in omega-6 fatty acids, although pecans contain about half as much omega-6 as walnuts. A diet rich in nuts can lower the risk of gallstones in women. The antioxidants and plant sterols found in pecans reduce high cholesterol by reducing the "bad" LDL cholesterol levels.